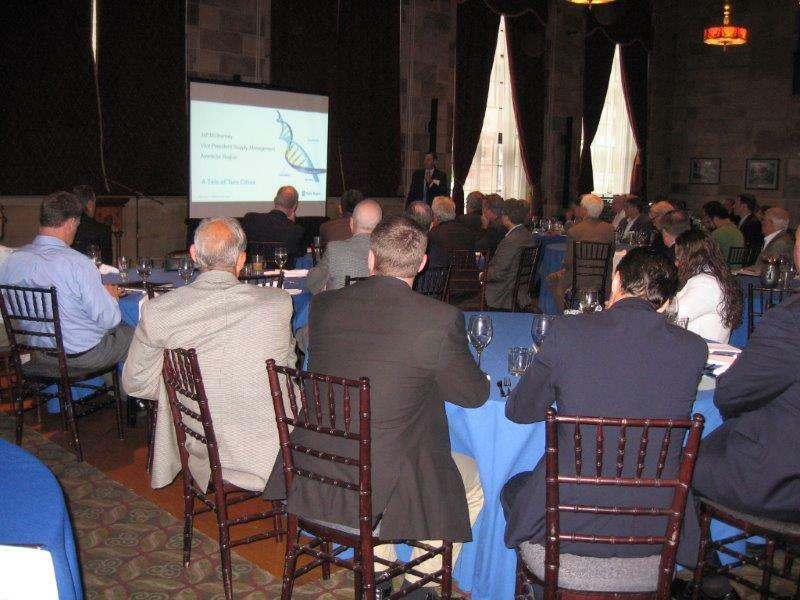 Cronus Partners LLC is pleased to announce the success of our ninth Aerospace and Defense Breakfast Forum. The event, one in a series of events covering the sector, was held today in Connecticut at The Society Room of Hartford. The forum attracted a wide audience of aerospace and defense companies, as well as government agencies and firms in the banking and legal community affiliated with the industry. Cronus Partners Managing Director Jeffrey S. Rubin and Senior Advisor Joseph H. Lubenstein presented snapshots of the M&A and financial markets and A&D sector performance. Jeff McInerney, Vice President, Supply Management, Americas, Rolls-Royce North America Inc., spoke on A Tale of Two Cities: New Business Potential in the Face of Unprecedented Uncertainty. Rolls Royce North America powers aircraft, ships and electrical generators, and its business is built on two technology platforms, gas turbines and reciprocating engines. Jeff McInerney is responsible for leading the company’s Supply Management strategy and organization in North and South America. He joined the company in October 2009 and is based at the company’s North America Headquarters in Indianapolis, IN. Mr. McInerney is a proven leader in supply chain management, lean manufacturing and engineering who strives to impact and continuously improve a company’s value proposition to its customers. Prior to joining Rolls-Royce he was the North America Purchasing Director at Nexteer (formerly Delphi Steering Systems, GM) in Saginaw, MI. Nexteer Automotive is a global provider of advanced steering and related technology. Mr. McInerney held various leadership roles as Plant Manager, Lean Supplier Development Manager and Material Cost Improvement and Supplier Development Director. He serves on the Manufacturing Engineering Technology Advisory Board at Western Michigan University and is also a member of the Center for Advanced Procurement & Supply (CAPS) Research.